For those of you who have been in the search marketing business for a while, you will be pleased to see Yahoo’s Search Marketing Desktop’s 2010 reincarnation of the Overture Keyword Tool. Yahoo’s new “Research Keywords” feature is Ajax based and approaches the research process differently than any other keyword tool I have seen before. Specifically after entering a url for keyword analysis, Yahoo’s keyword research tool presents a list of potential keyword phrases – one at a time – and then asks users whether the keywords presented are relevant or not. Users can then select Yes, No or Skip. While this process of selecting or deselecting keywords one at a time initially seems time consuming, it helps marketers first clarify who their target audiences are and more importantly who they aren’t. Yahoo’s keyword research tool provides the canonical form of the keyword – which I believe is a first for the keyword tool market- estimated search volume and advertiser competition. The tool also provides keyword suggestions from the Top 100, Top 500 and Top 1000 results. 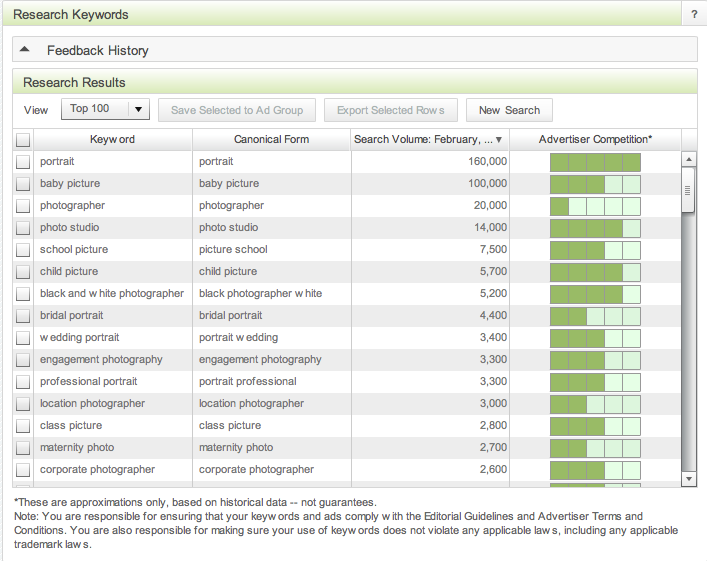 I am looking forward to using Yahoo’s Search Marketing Desktop Keyword Research Tool. Discovering its new features reminds me of the excitement I first felt when I discovered the Overture (Yahoo) Keyword Suggestion Tool. This entry was posted on March 5, 2010 at 5:58 pm and is filed under Keyword Research Tool, Yahoo Search Marketing Desktop. You can follow any responses to this entry through the RSS 2.0 feed. You can leave a response, or trackback from your own site.